In the past, I have talked about the slow speed at which the landscape changes...and how humans often do not perceive the change that is happening, even on their own farm and potentially even when they are the architects of the change. Well, the current rate of landscape change has sped up. The culprit is high commodity prices, which is not news....for the past couple of years, marginal grounds have been 'recovered' by removing trees and canceling CRP contracts to put ground into production. And, why not? There is money to be made. If you owned that piece of ground, you might make the same decision. But, a couple of bell-weather signs of the SPEED of this change have come out in the past couple of weeks. First, the state of Nebraska and the state of Iowa have both released news releases about the dramatic loss of trees. Nebraska went as far to issue a press-release that had the wording of an endangered species announcement....and the species of concern? The cottonwood. Who would have thought we would get to the point where people were concerned about one of the fastest growing, most common species (and our state tree)? "Habitat loss in the eastern counties continues to be a concern. Hunters are again advised to scout areas prior to hunting to make certain areas are still available." Yup, that's right...the landscape is changing so fast that you might not be able to hunt (or even find) the spot you loved last year. Wow. Grass disappearing quickly. Worst of all...that favorite shade tree might be gone. We live in interesting times. In the course of doing research for a new book, I ran across an interesting editorial on feral and free-ranging cats from 1933. The editorial appeared in Nature Magazine (published by The American Nature Association in Baltimore, MD). To place the editorial in context, remember that the 1930's were essentially 50 years (a couple of human generations, but perhaps 8-10 cat generations) after settlement of the western US by Europeans. In the Great Plains, these 50 years had seen massive transitions, including the obvious removal of Native Americans. Barbed wire had also appeared, farms now dotted the landscape, and mechanization was beginning to shape the size and shape of the farm. A transition that had not occurred to me was the appearance of cats in this landscape. Cats were introduced by Europeans aboard ships (to control mice). It is intriguing to think about the spread of cats in the western hemisphere. And, as cats spread, the number of feral cats increased. Feral cats, by definition, are cats that are outside, have no owner, and are not tame. 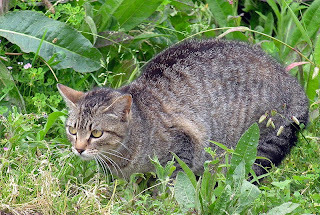 Free-ranging cats are cats that are owned but allowed to roam outside. By the 1930's, when the editorial below went to press, the problem of feral and free-ranging cats was already a controversy. Cats are still in the news. I have colleagues at the University of Nebraska who have recently contributed to the discussion about feral cats by providing management guidelines to those seeking to find solutions to feral cat issues. You might check the University of Nebraska's Extension publication or a book by Dr. Stephen Vantassel if you have further interest in the topic. Stephen suggests there are 60 million feral cats in the US (we have a bit over 310 million people!). The Wildlife Society, to which I belong, has released a position statement on feral and free-ranging cats, as well. All of the recent publications listed above have roused public outcry from some types of cat lovers. And, outcry of this type is referenced in the 1933 editorial, below. As you read the editorial, I think you will also notice the unique mix of the feral cat issue with the issue-of-the-day: declining wildlife in North America and the transition from sustenance hunting by humans to sport hunting. Wildlife laws were in place, but large bag limits (e.g., 15 ducks per day) were the norm. Thus, sport hunting and cats found a place on the same end of this editorial! Here, in its entirety from the March 1933 issue of Nature Magazine is the editorial "Cats: is some regulation of the feline a wild life necessity?" "Curled up in the corner of the sofa or purring contentedly before the fire, Tom or Tabby looks like a much-domesticated, well-civilized pet. Even to intimate that this view is debatable is to invite the ire of many. The friends of the cat are legion, ranging from those who own felines with imposing pedigrees to those who befriend any and every alley cat. And the number of cats forms a greater legion than that of their defenders. "It is just this great number that moves us to risk the deluge and to say something about cats. They pose a question of outstanding interest to lovers of wild life. It is a question that becomes more important as cats increase and our wild life wanes. "An heritage from a wild ancestry, there remains innate in the feline, however finely bred, the instinct of the marauder. In the dim past its ancestor lived in and from the forest, preyed upon and preying. Predatory instincts in a civilized environment cost us great sums for police and courts and jails. This trait is, in a cat, natural, not discreditable; in man, punishable. But that it does exist makes the cat a problem. "The solution most frequently proposed is that licensing of cats be compulsory. To this proposal the American Humane Association, in a brief statement, raises protest, declaring that "the idea back of the project is that if there were fewer cats there would be more game for sportsmen to shoot." It is true that most of the inspiration of the movement to license cats comes from sportsmen. It is likewise true that if there were fewer cats there would be more game. And, further, it is a fact that, as the Humane Association says, "there would be more game if there were less shooting." "It is plain that, between hunters and the cats, the game birds are in a sad way. It is our ardent hope that it will not be long before sportsmen recognize the inevitable and put their own house in order. At the same time we cannot see why, in the event of such a millennium, the feline should be preserved in a monopoly on hunting. "The Humane Association asserts that the public will have no sympathy with the licensing idea; that the farmer will not relinquish the aid of the cat in fighting rodents; that cat lovers will organize and post ten times more land against hunters. This last argument, we fear, is likely to appeal to bird lovers and true conservationist as an excellent reason for licensing cats. "We agree that the licensing idea is not a good one. We feel that a license for the cat would give it a preferred status as a killer. There are too many of these already. And we believe that cat license laws would be even less readily enforceable than are the current dog licensing laws. We recognize that one can fence against the dog fairly effectively, but no fence discourages a cat. "While we are alternatively agreeing and disagreeing with the Humane Association, we do not feel that the whole picture has been given. Our birds of song and beauty are favorite victims of the marauding cat. We have every sympathy for the bird lover who, having watched a family of baby birds develop in the back yard nest, destroys by the most convenient means available the cat which is about to wipe out the little family. If this cat bore a license, there might be a lawsuit. As it is there may be nothing more serious than the exchange of a few harsh words and an coldness between one bird lover and one cat lover. "Now that we have discarded the license idea for what we regard as adequate reasons, what remains? Not much, we fear, except the naïve hope that we are progressing in our ability to think of our fellow man. There is great joy and value in our human affection for a dumb creature, whether cat, dog, horse or other. But when we let that love become so dominating and so selfish that it infringes upon the right of our neighbor to invite songbirds to his bird houses, feeding tray and bird bath, we forfeit rights of consideration in return. As for the thousands of criminally thoughtless and inhumane people who turn cats loose to fend for themselves instead of turning them over to the local humane society, they have no right to the affection or companionship of any animal, dumb or otherwise. "Let us recognize, then, that the cat is naturally and frequently a predator; that the extent of damage done by the marauding feline is our own human responsibility; that the welfare of wild life in general demands a far better control of the homeless cat; and that those who wish to keep such a pet should feed it well and keep at a minimum its urge and opportunity to hunt." Editorial is from The American Nature Association. 1933. Cats: is some regulation of the feline a wild life necessity? Nature Magazine 24(3): 103.